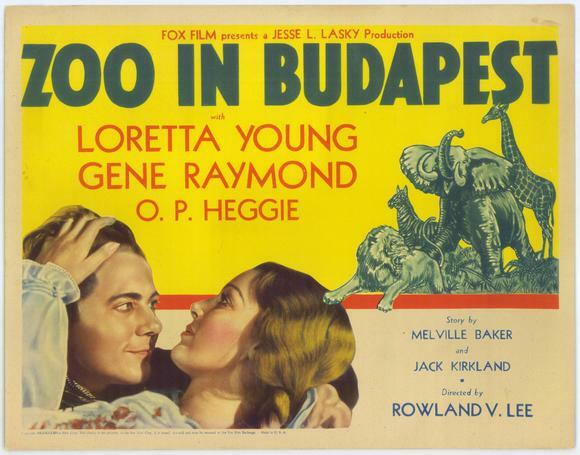 Animal-loving Zani (Gene Raymond) convinces 18-year-old Eve (Loretta Young) to run away from her orphanage and live with him at the zoo. Meanwhile, he’s wanted by the police for stealing a wealthy patron’s fox stole, and a young boy (Wally Albright) visiting the zoo escapes from his governess. When a search team sets out to look for the three missing folks, chaos ensues as animals are accidentally let loose from their cages. This odd curio by director Rowland V. Lee is simultaneously a romantic fairy tale, a rousing adventure story, and a metaphorical reflection on the nature of freedom and individuality. Comparisons between human animals and other animals are frequent and explicit: like the caged creatures at the zoo, Eve (played with lovely simplicity by doe-eyed Loretta Young) is confined by the strict mandates of her orphanage; Zani (who falls in love/lust with Eve based on appearance alone) openly compares her timidity to that of a deer; Zani nimbly leaps over fences like a chimpanzee; when Eve and Zani rest together in the grasses at night, the camera cuts to shots of various animals doing so as well; and when the couple attempts their final escape, so do the animals. Beyond this, however, it’s difficult to know exactly what message is being put forth by Lee, as the metaphors gradually fall apart. While it’s clearly not a good thing for the wild animals to be let loose out of their cages — unconfined, they will tear each other apart — we’re nonetheless meant to root for Eve and Zani’s escape. Perhaps the message is simply one of accepting all parts of our human nature, both “animal” and rational, while acknowledging the inevitable differences between species. Whatever its cryptic morality, Zoo in Budapest remains oddly compelling viewing, and will likely stay in your mind long after you’ve finished watching it. P.S. Unfortunately, given that the American Humane Association has only been monitoring animals on movie sets since 1940, there’s no guarantee that these majestic animals were protected during the making of the film — a fact which greatly impeded my enjoyment of the otherwise impressive final scenes. Yes. This unusual film has developed a small cult following over the years, and should be seen by all film fanatics. Listed as both a Sleeper and a Personal Recommendation in the back of Peary’s book. I can sort of see the appeal this film could have as a cult item – with its ‘outsiders vs. society’ theme. But, overall, I still think it’s kind of twee. Sometimes I saw the leads as similar to Tarzan and Jane, sometimes to Romeo and Juliet. But I don’t see that there’s all that much of a film here beyond the simple boy-meets-girl scenario – granted, in a somewhat unusual setting.